What the heck is a collet? Do I need one on my mini-lathe? The word "collet" is a classic example of something with which everybody in metalworking and engineering is completely comfortable and understands as second nature. However the newcomer can only look blank and hope guidance is coming along in a minute. A collet is, put very simply, a device for holding something. So does a chuck you say! Well, a collet is really a type of chuck. A chuck is really a sub category of collets. A collet is a bit of metalwork which allows you to strongly clamp a collar around whatever it is that you are tryng to hold in your collet. Most of the initial confused about collets is down to the fact that the term is used for many different items in many places in the metalworking workshop. You’ll have collets on the tap wrench, collets in the mini-lathe, collets on the mini-mill or micro-mill. Everywhere! I would imagine you have a Dremel drill, right? 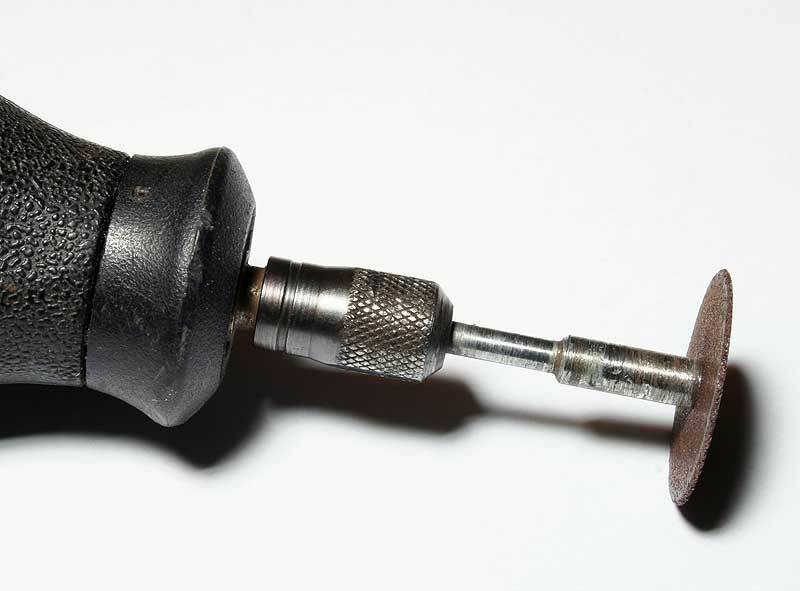 Everybody has one of these small hand-held drills popularised by Dremel. Now, your dremel drills and other accessories are usually mounted on an untapered metal shaft. You unscrew the ring on the front of the dremel, insert the tool, and tighten the outer ring. This clamps the tool firmly in the dremel, well aligned with the axis of rotation of the drill. That mechanism for holding the tool is a collet. The term collet refers to any job or tool holding device which works by clamping down onto the part. The main use of collets in my metalworking workshop is the collets I used to hold milling tools in my micro-mill. The back end of the collet is a Morse Taper. This means that it slots into the tapered spindle on my micro-mill. An M10 drawbar extends down the top of the micro-mill and engages the thread at the rear of the collet, putting it up firmly into the spindle. Because of the large mechanical advantage gained by using a spanner to turn the drawbar, the collet clamps very tightly onto the tool. Collets can also be used in a similar fashion to hold work in the mini-lathe. 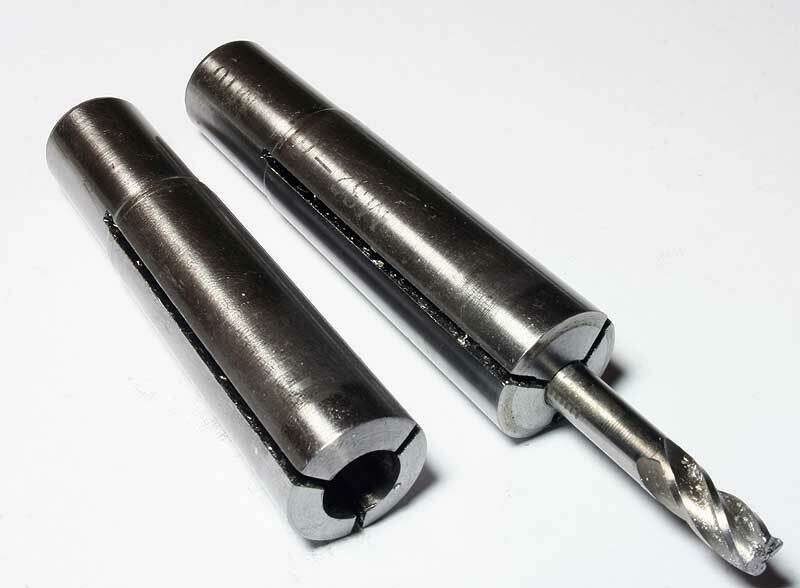 Instead of using those collets to hold milling tools in my micro-mill, I could remove the chuck on my mini-lathe, and insert the collet into the headstock spindle. This could be used to hold a workpiece very firmly, and, more importantly, better centred than could be achieved with any self-centreing chuck. Very strong force clamping the part – and it resists shocks that would knock a part out of the mini-lathe chuck. Quick and easy to switch to a new part. Of course, my two collets are great if your item is either 6mm or 10mm diameter. For anything else, I would have to purchase additional collets – and that can quickly get very expensive. However, there is a simple cost-benefit. If I am making up 100 items, all of which are 12mm diameter, it might make more sense if I purchased the required collet rather than spend several minutes centering the job in a 4 jaw chuck, one hundred times over! Bright and shiny collet sets can be found in toolshops – beware these are exceedingly tempting and extremely expensive, and you are not likely to use them all. Think carefully before buying!